This feature allows you to automate these 2 crucial processes (Quote & Estimate Visits and Site Visits) in your workflow. It will help you improve your relationship with your customer by ensuring a streamlined and efficient communication channel. You can automatically send reminder SMS messages for Quotes and Estimates, Site Visits, or both! You can remind your customer of Quotes/Estimates you've sent them or that you're heading over with automatic SMS schedule reminders. This can be used at any point and can also be turned off at the job level if you don't want this process in place for a certain job. You can turn off these settings at any point, thus stopping all reminders across your account. You can disable the SMS reminder for this job only, change who to send the reminder to, and customise the time frame. 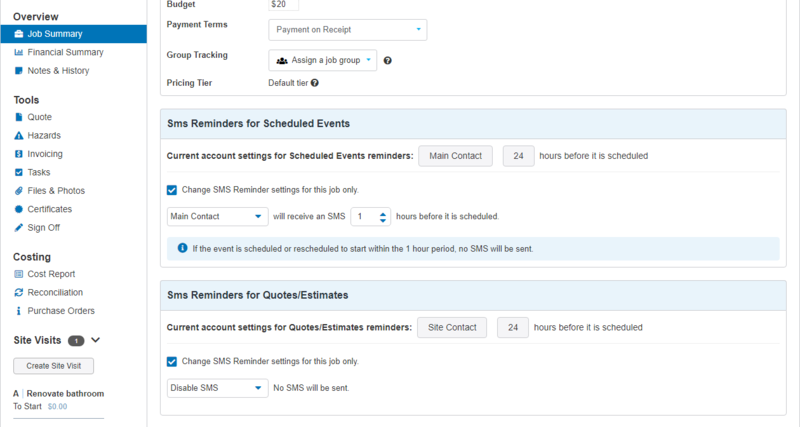 Note: You won't see the Quote/Estimate SMS reminder option on Charge Up jobs. If you set reminders to go out 12 hours beforehand you might get a grumpy customer woken up at 3am!